The Silver Bridge Bruisers started in 2015 and currently have about 20 members. They travel to surrounding states and cities to compete against other roller derby teams. 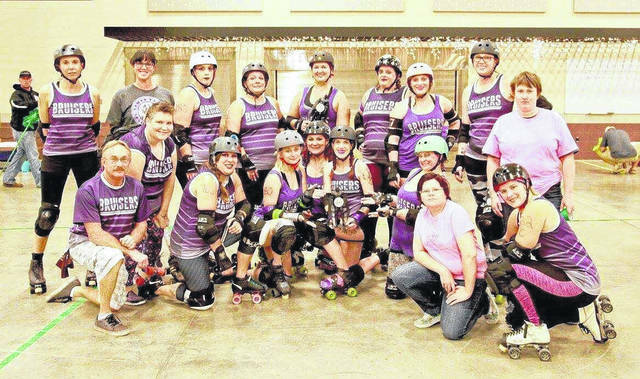 OHIO VALLEY — The Silver Bridge Bruisers will continue their roller derby tradition of competition into the new year. With the group’s founding in 2015, members are from Meigs, Gallia, Mason, and Jackson Counties. The organization currently has about 20 members. According to President Niki “Daisy Dynamite” Taylor, the Silver Bridge Bruisers is a flat track roller derby team, unlike other organizations that roll on banked tracks. While the team is an all women’s roller team, other organizations may be coed and or all men’s teams. “The majority of teams are women, but there are some men’s teams popping up in the area and some coed teams as well,” said Taylor. The Bruisers’ appearances are currently posted on their Facebook page, with fans able to catch them for the first time in 2018 on Feb. 11 in Huntington, W.Va. against the Poison Apples team. Coming up, the Bruisers will soon roll in Pittsburgh, Pa., Athens, and other places. They will compete mostly in scrimmages with other teams, but will compete in one tournament style competition with three other teams. Taylor explained that there is a score standing with WFTDA, but most teams just play for the fun of it. The Bruisers practice almost year round and schedule bouts against other teams when they can. Matches are exhibition-style predominantly and can roll against any team. There is a sanctioning body, the Women’s Flat Track Derby Association, WFTDA. It only provides rules and regulations and leaves the scheduling of matches up to team organizers. “Around here individual members put together the schedule, WFTDA doesn’t dictate it. There is no set season or playoffs, teams set their own schedules and play when they can get a game,” said Taylor. The bruisers’ team includes its coach and some non-skating officials. Taylor said members are fairly diverse; including women in their 20s and some mothers and grandmothers. Taylor said that members have to be 19 to join, and they are only looking for women skaters at this point, although men can join as officials. Prospective members don’t have to know how to skate either. Roller derby consists of two teams of five skaters, one of which is a jammer and four of which are blockers. Points are scored as the jammer passes the other team’s blockers, whose job is to prevent the other team’s jammer from passing. To learn more about the team, find their bouts, or join them on the track, find them on Facebook or Instagram at Silver Bridge Bruiser Roller Derby.